University of Delaware President Dennis Assanis (left) shared many a laugh with guest lecturer Richard Leakey during a question-and-answer period at Thompson Theatre. Assanis met Leakey while he was the provost at Stony Brook University, where Leakey and his wife, Meave, and daughter, Louise, are faculty members. 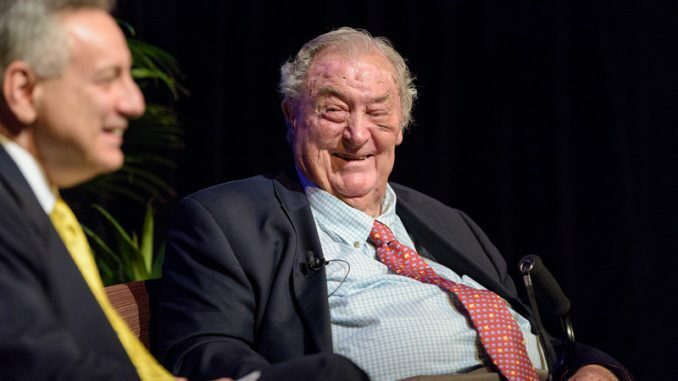 Those DNA ancestry tests so many people are having done might not tell you what Richard Leakey says is really true: Our deepest roots reach to Africa. Everything else is just a franchise. Leakey, born in Kenya to British parents, told a University of Delaware audience there is no longer any doubt where human evolution began. Those who argued there was insufficient evidence when he and his family made their early fossil discoveries decades ago were right, he said. 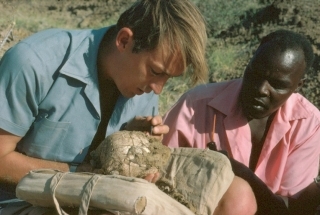 In this photograph from 1968, Richard Leakey is examining a skull found at Allia Bay in the Turkana Basin region of Kenya. Leakey spoke at UD at the invitation of President Dennis Assanis, whom he first met at Stony Brook University. Assanis was provost at Stony Brook before taking the reins at UD in 2016. Stony Brook is the academic base for Leakey’s Turkana Basin Institute in Kenya and includes Leakey, his wife, Meave, and daughter, Louise, among its faculty. He also makes a mean London broil, Assanis said, and produces quality wine at his Kenya vineyard. “It’s your motherland, so shape up,” Leakey said. To those still disturbed by the word “evolution,” he offered another message during his afternoon talk. “If the ‘e’ word still bothers you, let me say that there is plenty of evidence that humans have changed through time,” he said with a smile. New technology and genetic analysis have added significantly to the scientific evidence, he said. 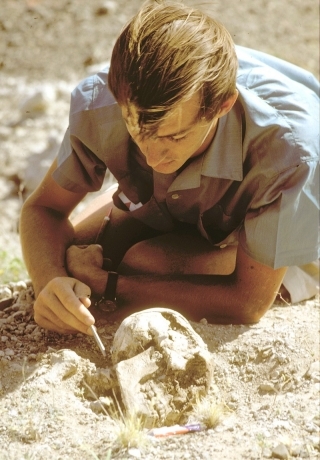 Leakey’s own evolution unfolded in the care of Louis and Mary Leakey, among the most famous archaeologists and anthropologists of the 20th century, credited with some of the world’s most significant fossil finds in Tanzania. The Leakeys raised their three sons in Kenya, where Richard later made his own mark with a team that discovered extensive deposits of fossils and early tools dating to almost 2 million years ago. His work in Kenya evolved, too, from fossil discovery to political office and leadership in conservation, where he could shape policy, fight corruption and stand against the devastating impact poachers and black-market ivory peddlers had on the elephant population. He has continued his work and strong advocacy despite life-threatening situations, including a 1993 plane crash that forced amputation of both his legs below the knees. He had recent surgery to address skin cancer that had developed inside the lid of his left eye – and that eye was sewn shut. He used a cane to steady himself and joked about that when he met with students in Munroe Hall. “Without legs and only one eye—I have to be a bit cautious,” he said. Now maybe. But his path in science, politics and conservation was marked with extreme opposition and peril – death threats, canisters of tear gas, dismissive critics, deadly plots. Some dismissed him because he lacked the academic credentials others had earned. Instead, he was driven by curiosity. He listened a lot, he learned a lot, he absorbed a lot, he said. Kamoya Kimeu (right), considered one of the greatest fossil hunters of all time, worked for many years with paleoanthropologist Richard Leakey (left) and Leakey’s wife, Meave, also a paleoanthropologist. Kimeu got his start with Leakey’s world-renowned parents, Louis and Mary Leakey. With the great fossil hunter Kamoya Kimeu on his team in 1984, Leakey discovered “Turkana Boy,” the nearly complete skeleton of a pre-adolescent Homo erectus male, estimated to have died 1.6 million years ago. Not that formal education is a waste of time. He spoke to that during a special 90-minute session at Munroe Hall, where students of Prof. Karen Rosenberg, a fellow paleoanthropologist, and Prof. Wunyabari Maloba, chair of Africana studies, gathered to talk with him. Jorge Serrano, assistant professor of Africana studies, asked Leakey how he thought humanity might evolve in the next 15 generations. “I don’t believe physical changes—in terms of what we look like—can happen,” Leakey said. “To make genetic selection stick, we have to isolate that population and need 200,000 years minimum. Kobe Baker, studying anthropology and Africana studies at UD, asked if conservation efforts are a losing battle. Maloba asked Leakey to explain to students why his work is important for humanity. “With an intelligent brain—even a moderately intelligent one like mine—you have questions you want to ask,” Leakey said. “…With new techniques available, we can now learn so much. There is so much opportunity for anthropologists. 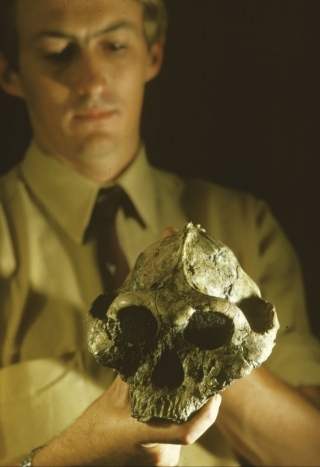 Paleoanthropologist Richard Leakey holds the skull of the hominid Australopithecus robustus, which he found in August 1969 at East Turkana, Kenya. The skull was dated at around 1.6 million years old. Climate change plays a role in the environmental stresses all species face, he said. With oceans growing more acidic, melting ice at both poles and other rapid changes, “there may be serious collapses within several food chains,” he said. Such phenomena have occurred before, he said, with extinction always the result. “But humans weren’t there then,” he said. 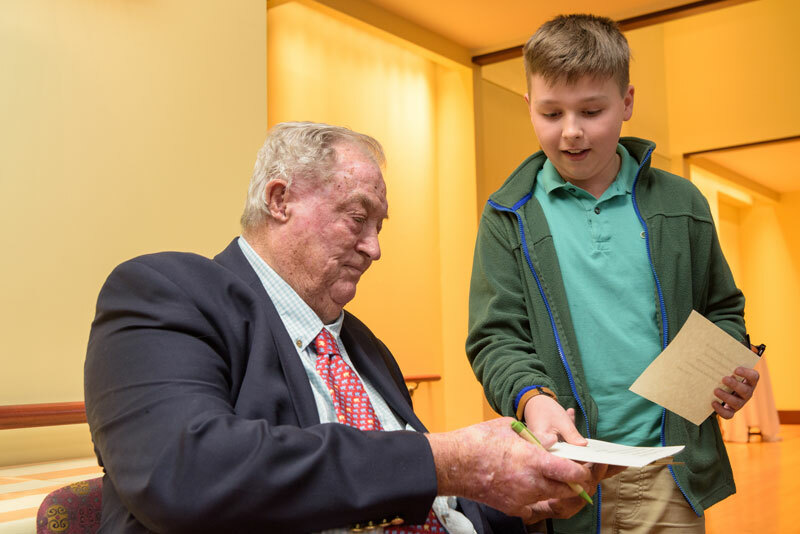 During a post-lecture chat with Assanis, Leakey answered a series of questions and offered a few bits of advice to students considering their futures. Baker said he was thrilled to meet and hear from Leakey. Drew Brown, assistant professor of Africana studies, said Leakey plays a role in helping to complete the narrative around human origins. “Even when it comes to the creation of races, anthropological findings are a major piece of that,” Brown said. 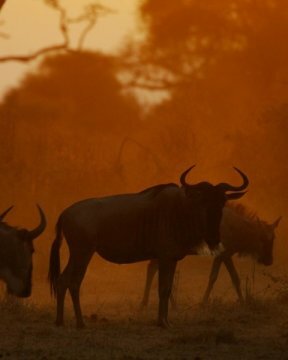 “This creates Africa as being the cradle of such a great species. There is no way you can look at Africa or Africans as secondary to you or anything. Rosenberg was delighted to hear from someone who has transformed her field of study. Leakey said he has found no evidence to support religious claims of human origin—a statement that drew applause from some in the Thompson Theatre—and he loses interest when such questions arise. But scientific evidence of humanity’s emergence in Africa is established, he said, and the evidence allows for increasingly specific timelines. 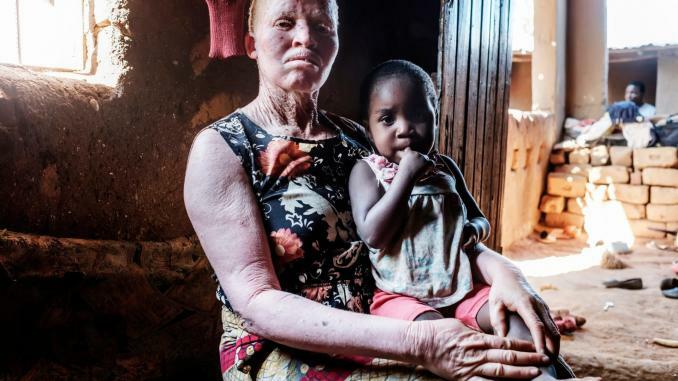 “We all descended from a population that left Africa less than 100,000 years ago,” he said. 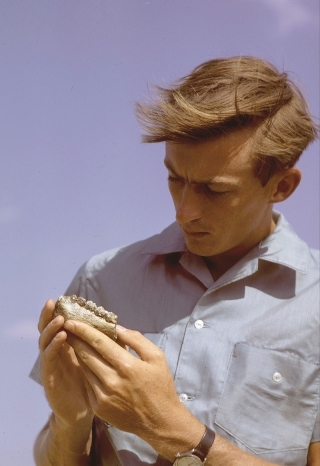 Richard Leakey, seen in this 1968 photo, and his expedition team spent years uncovering and examining fossils discovered in Africa. Here, he holds a jaw bone with several teeth intact. Furthermore, he said, pale skin—the kind Caucasians have—is a trait less than 10,000 years old. Blue eyes are less than 8,000 years old. He doesn’t think there is such a thing as a black person or a white person. So if your family tree and that sketchy DNA sample say you’re from this place or that—go ahead. Wear your kilt, learn Spanish, make the family’s best-loved Thai recipe. But remember your roots, Leakey would say. We’re all really from Africa. Q: What are your views on ecotourism? A: It’s an oxymoron. 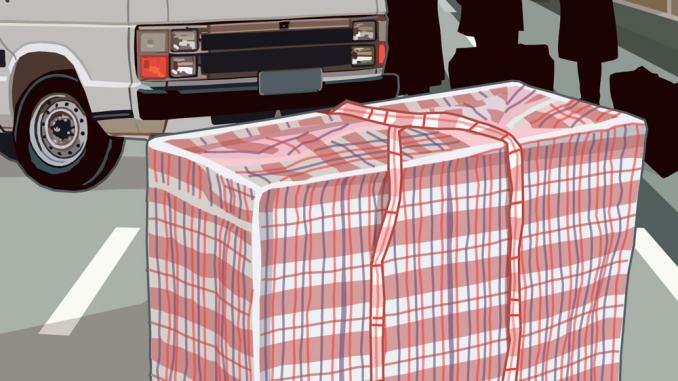 The best chance for wildlife is to leave it alone—not tromping around with Jeeps. But if there is no money, they can’t protect it. It’s really a very, very complex formula. A solution can be found, but I’m glad I’m not in charge now. Q: What about all of the competition in science? A: There is so much competitiveness in science now—and a lot of it is because of how you get grants. If Charles Darwin had to write an NSF [National Science Foundation] proposal today, we’d have never heard of him. Q: What is left to be found? A: Most of these fossils have been published as photographs—two-dimensional, blurry photographs. Today, to get anything published you have to have CT scans. What my daughter, Louise, is doing at africanfossils.org makes it possible to print out your own hominid fossils. You can cut them out from cardboard. When my wife, Meave, finds something in Turkana and wants an opinion, she sends a scan to someone and gets information back. The other day she found a mandible—badly crushed. In the old days, we would have said it was not even worth collecting. But she sent it for micro CT scanning and a grad student at Stony Brook spent 70 hours—70 hours—on one tooth. And I can tell you these are teeth unlike any hominid teeth I’ve ever seen. The use of new technology is huge. I think it’s a base from which another 50 years of extraordinary work can be done. The golden years are ahead of us, not behind us. Just be tolerant of the shoddy work we did. Q: You are a white Kenyan. A lot of people don’t know that is a thing. A: I only run into that outside of Africa. How stupid were they to think Obama was not American? He identified entirely with America. If you identify completely, you can be completely identified.